Are you considering some home improvements but you don’t want to spend a lot of money? 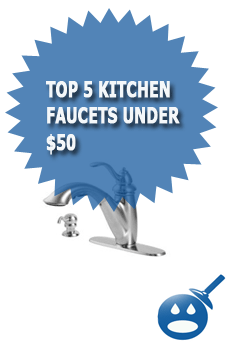 Then you have come to the right place, we can offer you a list of the top 5 kitchen faucets for under $50.00. 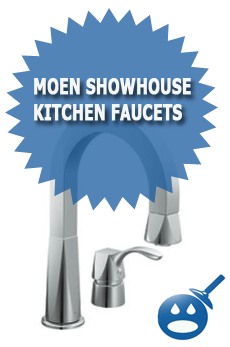 Now you can have a new faucet for your kitchen and not go over the budget. With home improvements being made and you are saving money as well. You are increasing the value and the beauty of your home. There are people who are not aware that there are kitchen faucets under $50.00. When you shop online the most expensive ones are the styles that they display, you really have to dig deep to find them. But stores like Lowe’s and Home Depot can really save you money. You may think that inexpensive may mean that you have to compromise quality but you don’t. With manufactures like Delta and Price Pfister who are two of the most recognized in the industry, you are getting high quality and high performance fixtures. The Delta Chrome Kitchen Faucet Model P20-L offers a swivel spout of 360 degrees. This feature will make cleaning and food preparation easier than before. You will get clear knob handles that are easy to turn, making them perfect for people with arthritis or other hand conditions. The Delta Chrome Kitchen Faucet is a washerless stem cartridge faucet. 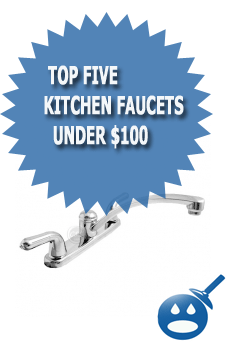 It is made with a durable chrome finish that will protect the faucet from rust and corrosion. 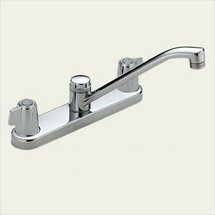 This faucet is a double handle faucet that is CSA safety tested and certified. This design is categorized as Contemporary and Traditional. The finish is Chrome and it is a 3-hole installation. 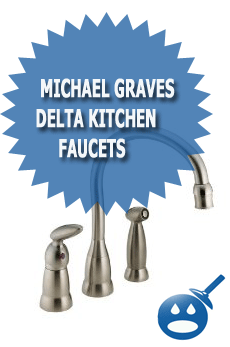 The price on the Delta Chrome Kitchen Faucet Model P20-L is around $28.79. The Delta Chrome Kitchen Faucet With Side Spray has a 360-degree standard spout swivel making clean up and food preparation quicker. This kitchen sink offers a convenient side spray for deep pots and pans. This is a double handle kitchen faucet with a washerless stem cartridge. The handles are easy to grab and easy to turn. The faucet installation is a 4-hole installation with an IPS connection. The Delta Chrome Kitchen Faucet with Side Spray offers a durable chrome finish that protects the faucet from sediment build up and tarnishing. The faucet comes with cleaning instructions that are easy to follow; there are no special polishes to buy just a mild soap. This faucet doesn’t come with a soap dispenser but it does have a side spay also done in a Chrome finish. This kitchen faucet costs about $35.00. 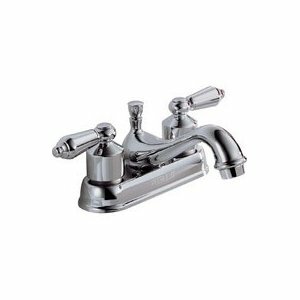 The Price Pfister Polished Chrome Kitchen Faucet Model WK1100C is a single handle, single control faucet. It has a Polished Chrome finish and is the Classic Series Kitchen Faucets from Price Pfister. This faucet is a traditional 3-hole style installation. It is ADA approved and certified. The connection type is a threaded connection with the Cover Plate included. The Price Pfister Polished Chrome Kitchen Faucet Model WK1100C is a simple style that offers a great look at a great price. This faucet has a Price Pfister Lifetime Pforever Warranty that covers the finish and the faucet functions for life. Make sure that you register your warranty and follow the instructions. The cost of a Price Pfister Polished Chrome Kitchen Faucet Model WK1100C is around $35.00. The Price Pfister Polished Chrome Kitchen Faucet is a dual handle high arc spout. This style of faucet is good for smaller sinks and deep pots and pans. The sink is a 4-hole installation with side spray. This faucet is constructed with a Polished Chrome finish that will protect the faucet from sediment build up, tarnish and rust and corrosion. The Price Pfister Polished Chrome Kitchen Faucet can be found in the Classic Series from Price Pfister. The faucet has a threaded pipe connection for easy installation. The faucet is CSA Safety Listed and Certified and it is NSF listed as well. The Price Pfister Polished Chrome Kitchen Faucet is covered by the Price Pfister Lifetime Pforever Warranty. The price on The Price Pfister Polished Chrome Kitchen Faucet is about $ 48.76. The Price Pfister Polished Chrome Kitchen Faucet Model WK1140C offers a 4-hole installation single handle installation. This faucet comes from the Classic Series from Price Pfister. This is a contemporary style faucet that will look great in any kitchen decor. This style faucet has easy to follow installation instructions, you can do it yourself and save money rather than spend a hundred dollars or more paying someone to install it. The Price Pfister Polished Chrome Kitchen Faucet Model WK1140C comes with a stylish side spray, perfect for food preparation and clean up. This faucet is covered under the Price Pfister Lifetime Pforever warranty. Make sure that you read the instructions and the warranty information. Make sure that you register the warranty information when you get the product. The price of the Price Pfister Polished Chrome Kitchen Faucet Model WK1140C is about $46.99. These days everyone is trying to save money on home improvements and often they don’t want to do the repair but there comes a time when it is necessary. So why not start shopping smart and look deeper into the websites to uncover the real bargains. A lot of plumbing fixture websites don’t want you to know about the bargain prices so they bury them deep into the site. But with everyone trying to save money, it is worth it to spend a few more minutes looking for the better deals. If you shop at stores like Lowe’s and Home Depot, make sure that you take the time to locate the better deals; they may be located on the bottom shelves.